Old Town Glass is Marin County’s Premier Window and Door Retailer. 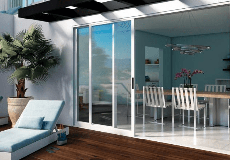 Whether you're in search of a new or replacement product, we have the aluminum, vinyl, wood, aluminum clad wood, fiberglass, or steel window or door that will be the perfect fit for your budget and style. As a family owned and operated business we strive to provide the best service and the best product fit for our clients. We don’t have sales reps based on commission and our staff want to will work with you to achieve your goals. We frequently work with homeowners, contractors, architects, and designers to specify and supply products for their clients. Our installation crew, will work with a contractor’s staff, to install the more complex products that we offer. Old Town Glass is rated 4.6 out of 5 by 16. Rated 5 out of 5 by lcr227899 from Great Company with Years of Experience I have been working with Old Town Glass for years. They are a great company and seem to have a lot of knowledge on the products they sell. I purchased all of my Milgard windows from them many years ago. But Every time I call they come out and look at what is going on with my windows and doors. They have taken care of my locks at no charge when they needed to be adjusted. Great Service! I just found out Milgard is having them do their service work. This is wonderful to have a local company doing the service on my house. Having Old Town replace my glass has made the entire service experience much better. Old Town just completed my service and I can now see through my windows again. Rated 5 out of 5 by leezch from Great Knowledge and Expertise My Husband and I were looking for a company that could do almost everything for our remodel. We went visit quite a few Milgard dealers before we decided to purchase from Old Town. We chose Old Town Glass because their staff was very helpful and knowledgable. They seemed to know all about the Milgard product and other items we asked for. We got our shower and mirrors from them as well. We had them install for us and they explained the type of water proofing they were using and that they use pans under there doors. We have worked with lots of contractors and never been explained any of this before. Old Town Glass was very courteous and so great to work with. Rated 1 out of 5 by MMQhomeowner63 from Terrible Experience All the Way Around and Getting Worse Given Old Town’s incompetence and costly mistake and many other failures, we will be going elsewhere for our future window and door needs. Here is our story after spending over $11,000.00 with Old Town. We are remodeling an entire home in Marin where we recently moved. We extensively remodeled our prior home on the SF Peninsula using Milgard windows. We were very pleased with the supplier and Milgard – no problems whatsoever. When we moved to Marin, we reached out to Milgard to once again purchase windows. Milgard referred us to Old Town Glass in Novato, CA. We requested that Old Town come out and give us an estimate for a portion of the windows as we are doing the remodeling in stages. We received an estimate for the windows plus labor for installation by Old Town. While Old Town prices were competitive for the windows, its labor costs were significantly higher that anyone else from which we received quotes. Thus, we decided to purchase the windows without Old Town labor and looked to another contractor for the installation. When we were ready for the next phase, we again had Old Town come out and give us an estimate. We later purchased a Phantom screen system and had them install it. This is where our problems began. There were significant delays in receipt of the window orders which we could live with. They also seemed to have lost our screen order and the receipt and installation took much longer than originally promised. When the windows finally arrived, one window (which was supposed to be the same size as the first hall window) came in significantly larger than what it was supposed to be. In fact, it was about 6 inches longer than the existing window opening. As a result, we could not use the window as it was significantly taller than what would have worked even if we made the current opening larger. We would have made the opening larger if we could, but we would have been into the header and roof. Thus, the window was completely unusable and there was no other place to use it in the house. We went back to Old Town because they did the measurements. Not only did the owner refuse to speak with us after numerous requests, his staff repeatedly said it was all of our fault because we were solely responsible for measurements if we were not using Old Town for installation. Now, if it was a couple inches off, we could have dealt with the situation, but this window measurement was way off. We relied on Old Town as the expert to measure the windows accurately. We also could not believe that they would not work something out with us after ordering over $11,000.00 in windows from them and we were intending to place significant additional window and door orders from Old Town for our next phases of remodeling. Old Town refused to work with us. After some discussion with Milgard and our offer to financially participate in the purchase of a replacement window, Milgard helped negotiate a replacement window for half of the original cost. Milgard was essentially willing to sell the window to Old Town at a significantly reduced price and we were going to pay a significant sum. Thus, Old Town bore no financial loss in the situation. Rated 5 out of 5 by Rockon from This family operated company is one of the best in Marin County. We have used Old Town Glass for several years on quite a few projects including new construction and remodels. They have incredible service and knowledge of their products. We completely gutted an apartment building in San Rafael and used Milgard replacement windows. They are beautiful. The white vinyl finish and dual pane windows cleaned up the outside appearance of the building. It was built in the early 1900's, so the insulation improvement was substantial. The windows handle and move very smoothly with locking devices that make our tenants feel safer. We easily installed the windows and are very satisfied. Rated 5 out of 5 by GBode from Who's Down With OTG!? Yeah! You know me!!! The entire staff at OTG is wonderful! Extremely helpful and knowledgeable. Hardworking, passionate, and detailed oriented, this family owned business is top-notch! Thank you OTG for all your hard work and help!